Matching Numbers. Chassis # 1980404500081 Engine # 1989804500098. DB 040 Black with Light Tan Leather Interior. Factory Concave Star In Grill. Knock-Off Rudge Style Wheels. Books and Tools. Knock-Off Hammer and Jack. Belly Pans. Offered with Correct Matching Luggage, Build Sheet and Original Steering Wheel. Since 1974, this 1954 300SL Gullwing resided in the State of Colorado where it was owned by well known long time Gullwing Group member Richard P. Fleenor. According to the Gullwing Registry, prior to Fleenor there were four owners all located in the State of California. In chronological order, they are listed as Katherine Rice of Fremont, Lee Chavez of Oakland, Reuben A. Lusvardi of Foster City and Phil L. Graves of Union City. The cosmetic quality shown throughout is apparent in the paint, interior, engine bay and underside of this exceptionally well cared for Mercedes-Benz icon. Originally delivered as a special order vehicle in DB 180 Silver with 641 Red Leather interior with chrome wheels, this Gullwing example was restored in the early 2000’s by our good friend and top class 300SL specialist Rudi and Company. The black paint accentuates the familiar curves and lines while showing a perfect body underneath and the cosmetic appearance is complemented quite well by the light tan leather interior for a sleek 300sl product. As agreed by many lovers of the model, the rudge style wheels add a sense of completion to the overall powerful look of this long term ownership Gullwing. Mechanically, the car is in an excellent condition and runs exceptionally with the engine having been rebuilt during the Rudi and Company restoration process. 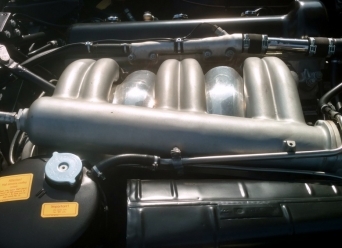 The engine has been upgraded with a performance enhancing 300sl roadster distributor and a more modern starter. Both of the original distributor and starter which were removed and replaced are still with the car and function properly if a new owner wished to reinstall them for a truly factory mechanical function. The car currently has a period correct wood Nardi steering wheel in place but for the purist also comes with its factory original steering wheel. The engine bay of the car is exceptionally clean and well detailed. Underneath the nearly unblemished belly pans is a rust free and exceptionally clean undercarriage…no more than to be expected from such a long term and well cared for ownership tenure. For correctness and quality throughout as well as condition, this timeless Mercedes classic excels as a truly high quality restored car that presents as well as it drives. This car needs nothing and is ready for show or driving events. 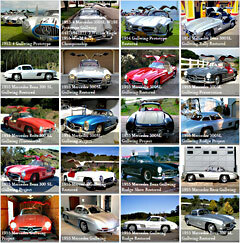 SOLD: 1955 Mercedes Benz 300 SL Gullwing 1954 Mercedes-Benz 300SL with Canadian roots sells for $1.9M SOLD: 1954 Mercedes-Benz 300SL Gullwing A working 1954 Mercedes-Benz 300SL Gullwing …made of LEGO!